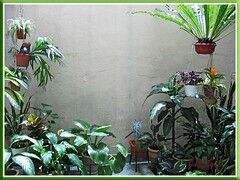 It is almost two years since we last shared about this indoor garden space of ours. 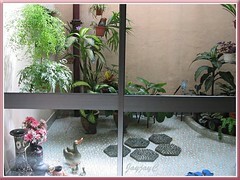 Hmm…about time to update here the interesting plants that currently fill this courtyard and give us much pleasure and joy. This rectangular void is adjacent to our dinning hall and separated by sliding glass doors and partly surrounded by walls and windows. 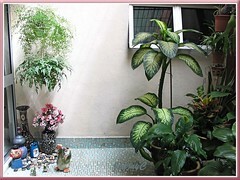 Though measuring just 13 feet by 8 feet, it is wonderfully packed with foliage plants mostly, and roomy enough to potter around, as well as do some foot exercises on the stepping stones placed therein. 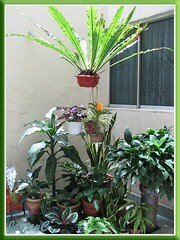 Above, we have fixed a metal grille across for security reasons, and the metal bars serve as support for our hanging pots too. Great, huh! Moreover, passing sunlight between 10am to 2pm filters through a nylon-netted screen placed above the grille, just perfect for our semi-shade-loving plants to thrive healthily in a cooler, yet bright environment. 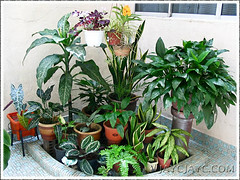 The open space allows plants to be watered by the rains and wet with dew too. Here’s sharing some photos captured during this lovely September month to give you a peep into what is behind the scene, so to speak. Hosta? (Update 20090425: It does flower after all!) It’s not hosta but Proiphys amboinensis! Just knew its ID, July 28, 2009. 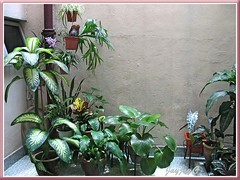 Our Indoor Garden – a courtyard actually!